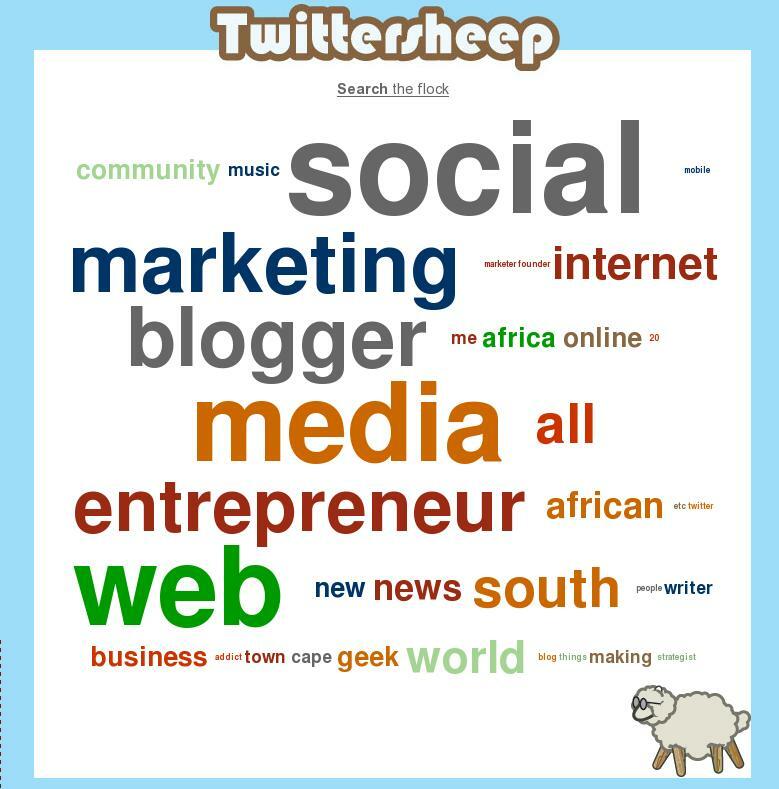 Twittersheep: what are you all talking about!! Today was my day with Twitter problems. Some background – I am running Ubuntu on all my machines and have used Twirl as a Twitter client. Now being on Linux also means that the version of Adobe Air that I run is very beta. So this morning when I started Twirl, it just gave me an empty screen. Being busy all day, I never had any time to really look at it. When I got home, I tried Twirl again and it say that a new version is available and would I like to upgrade. Like a good boy I upgraded and then the surprise. Sorry but Twirl needs a newer version of Air which is not available on Linux. So I am really snookered. So the only way to follow Twitter at the moment is via the web client. Currently trying out gTwitter and but I do not really like it .. very limited. So Mr/Miss/Mrs Lazyweb, any advice to get my Twitter addiction without the web client. And there I though geeks only talk about tech stuff. Suppose they have to eat also. Reach for a Dream needs your help!!! Everyday I come to the realization how fortunate I am. I have people I call my friends and people that call me their friends. I have great kids who are healthy and do most of the things they want to do. However there are lots of people and especially kids that have dreams but have no way in getting there. That is where Reach for a Dream comes in. It is one of my favourite charities and you can also help. If you can help then please pledge via this form. Every little bit will help to make some kid’s dream come true. My blogging friends, please follow Mike’s and my lead and spread the word about this and post a blog entry. I always wanted to go climb Kilimanjaro and this is just a little more inspiration to go and do it. As mentioned yesterday, Stormhoek is now available at your nearest Checkers. 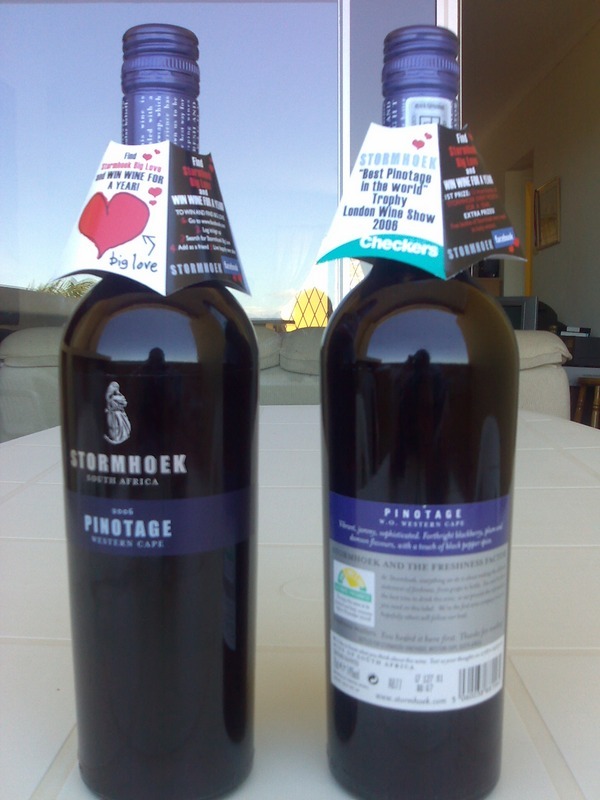 Went down to my nearest Checkers (Willowbridge) earlier today and found some Stormhoek Pinotage 2006, as can be seen from the pic to the left. Click on it for a larger one. Will enjoy some of it this evening .. will post my view of it afterwards. Now for that T-shirt and would not mind the supply of Stormhoek for a year either. Yippee, Stormhoek in the Retail stores!!!! After drinking some Stormhoek wine at 27dinners, I always wondered where to buy some. Now it is available at Checkers according to this post. It is great to eventually be able to get some. I will make sure to pop into my nearest Checkers tomorrow morning to see if they have stock. That will be the Checkers at Willowbridge.